The larger the family, the more holiday shopping that has to be done! Sometimes it can be a challenge coming up with the right gifts for family members. Here are a few tips to help you get your shopping done while finding the perfect gifts at the perfect price. When it comes to your children, remember to go through their current toys and sell or donate some of the old and unused to make room for the new. When you do this, you will better understand which types of toys are getting the most long-term use, and you may also get ideas for stuff that would go with their current favorites. I find that the holidays are the perfect time to get those big gifts that you may not ordinarily buy. If you keep your eyes open on a site like VarageSale, you may be able to score big items like a pool table or gaming system. When all else fails, kids are always more than happy to make a wish list! Now this can be tricky! When shopping for a romantic partner, it is nice to find a gift that shows you’ve put a lot of thought into what types of things they like or—even better—that you’ve noticed something they’ve been wanting for a while. Gift ideas can vary widely, and while some spouses are easy to please with a watch or a piece of jewelry, others may prefer a pair of well-researched hiking boots! My best tip here is to listen closely for hints they may drop in the weeks coming up to the holidays or think about what might be a good fit for their hobbies. Once you know what you want to buy, do some digging online. There are many sites offering coupons that will help make that one special item a lot more affordable. I love starting with things I know they need. Once the basics are covered, I go with delicious treats. I stock up on international food items that are less common, but much appreciated, from places like TJ Maxx or World Foods. A few boxes of gourmet cookies, high-quality olive oil or other such treats always make for a pleasant surprise. Holiday spending can be hard on the wallet. I typically come up with a budget by preparing beforehand, selling items that we no longer use or need, using coupon sites, shopping at discount retailers and splurging on some extra special gifts! What are your tips for picking the right holiday gifts? 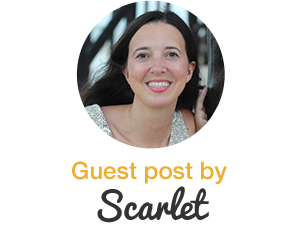 Scarlet Paolicchi is a blogger, wife and mother of two. She loves family time, travel, healthy food and green living. She blogs about all things family related. Read more of her stuff at Family Focus Blog.